"Firdaus" redirects here. For the city in Iran, see Ferdows. In Islam, Jannah (Arabic: جنّة‎ Jannah; plural: Jannat), lit. "garden", is the final abode of the righteous and the Islamic believers, but also the Garden of Eden, where Adam and Hawwa dwelt. Firdaws (Arabic: فردوس) is the literal term meaning paradise, but the Quran generally uses the term Jannah symbolically referring to paradise. However "Firdaus" also designates the highest layer of heaven. In contrast to Jannah, the words Jahannam and Nār are used to refer to the concept of hell. There are many words in the Arabic language for both Heaven and Hell and those words also appear in the Quran and hadith. Most of them have become part of the Islamic traditions. Jannah is often compared to Christian concepts of Heaven. While Jannah in the Quran is often translated as "Heaven" in the sense of an abode where believers are rewarded in afterlife, سماء sama' (usually pl. samawat) is the word for heaven in the sense of firmament or celestial sphere, as "seven heavens" (2:29, 78:12). Some sources connect the two in some way. According to Sufi cosmology, Paradise is often depicted over the seven heavens or between the sixth and seventh heaven. 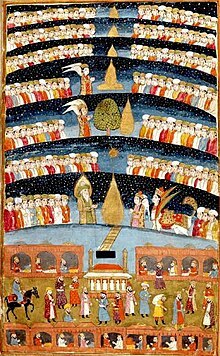 In some modern interpretations, based on Surah 21:30 and 67:5, the lowest heaven is also interpreted as the observable universe, with the other six beyond, once were a mess together[clarification needed] with the earths and later expanded. An artists representation of "Muhammed's Paradise". A Persian miniature from The History of Mohammed, Bibliothèque nationale de France, Paris. The Paradise is described as surrounded by eight principal gates, each level generally being divided into a hundred degrees guarded by angels (in some traditions Ridwan). The highest level is known as firdaws (sometimes called Eden) or Illiyin. Entrants will be greeted by angels with salutations of peace or As-Salamu Alaykum. Furthermore, paradise is considered to be "as vast as the heavens and the earth". In the Quran, "the Garden" is described with material delights, such as beautiful maidens, precious stones, delicious foods, and constantly flowing water—the latter especially appealing to the desert dwelling Arabs, who spend most of their life in arid lands. The Islamic texts describes life for its immortal inhabitants as: one that is happy—without hurt, sorrow, fear or shame—where every wish is fulfilled. Traditions relate that inhabitants will be of the same age (33 years), and of the same standing. Their life is one of bliss including wearing sumptuous robes, bracelets and perfumes as they partake in exquisite banquets served in priceless vessels by immortal youths (Houri), as they recline on couches inlaid with gold or precious stones. According to Muslim belief, everything one longs for in this world will be there in Paradise. They will eat delicious food and drink, and every bowl will have a new taste. They will take eructation which will digest the food and there will be perfumed sweating for the digestion of water. Inhabitants will rejoice in the company of their parents, spouses, and children (provided they were admitted to paradise)—conversing and recalling the past. One day in paradise is considered equal to a thousand years on earth. Palaces are made from bricks of gold, silver, pearls, among other things. Traditions also note the presence of horses and camels of "dazzling whiteness", along with other creatures. Large trees whose shades are ever deepening, mountains made of musk, between which rivers flow in valleys of pearl and ruby. The names of four rivers are Saihan (Syr Darya), Jaihan (Amu Darya), Furat (Euphrates) and Nil (Nile). Salsabil is the name of a spring that is the source of the rivers of Rahma (mercy) and Al-Kawthar (abundance). Sidrat al-Muntaha is a Lote tree that marks the end of the seventh heaven, the boundary where no angel or human can pass. In spite of the goodly dwellings given to the inhabitants of paradise, the approval of God and nearness to him is considered greater. According to the Quran, God will bring the elect near to his throne (‘arsh), a day on which "some faces shall be shining in contemplating their Lord." The vision of God is regarded as the greatest of all rewards, surpassing all other joys. The true beauty of paradise is also understood as the joy of beholding God, the creator. This life belongs to the world of earth and the world of visibility; the hereafter belongs to the world of transcendental and the world of beings. By this life I understand your state before death, by hereafter I understand your state after death ... However, it is impossible to explain the world of beings in this life by any other means than allegories. According to the Quran, the basic criterion for salvation in the afterlife is the belief in the oneness of God (tawḥīd), Angels of God, revealed books of God, all messengers of God, as well as repentance to God, and doing good deeds. Though one must do good deeds and believe in God, salvation can only be attained through God's judgment. Regarding salvation from hell, according to hadith literature, Muhammad said, “Surely a time will come over hell when its gates shall be blown by wind, there shall be none in it, and this shall be after they have remained therein for many years.” Still in the Hadith literature, Muhammad is reported to have said, "Allah will bring out people from the Fire and admit them into Paradise." Otherwise some hadiths indicate, that the majority of mankind will not access heaven. According to Sunni Islam, a Muslim, even if condemned to hell, will eventually enter Heaven. As in life there are many trials which one must face. This is also a condition individuals must encounter in order to enter Jannah. Did ye think that ye would enter Heaven without Allah testing those of you who fought hard (In His Cause) and remained steadfast? There are different opinions among scholars in regard whether Non-Muslims could enter Jannah. Some Muslims and Islamic scholars argued Surah 2:62 indicates Jannah is not exclusively for Muslims. On the other hand, other scholars hold this verse is abrogated by Surah 3:85 and just applied until the arrival of Muhammad. For example, before Jesus was born, Jewish will enter Jannah alike Christians who lived before Muhammad enter Jannah, but every religious group must accept the newest prophet. Scholars like Ibn Arabi did not hold the first to be abrogated by the latter, since "Islam" in this context, does not apply to Islam as a religious tradition, but to "submission".Ghazali distinguished between the "saved" and "those who will attain success". Therefore, righteous Non-Muslims will neither enter hell nor Jannah, but will stay in Araf. Further those, who regard Jannah as exclusively for Muslims argue, that Islam is the "completed" and "perfected" religion and it is necessary to believe in the whole teaching of God, the prophets and the angels that just can be done by a Muslim. According to the Islamic theologian Süleyman Ateş, argues Muslims had made the same mistake Jews and Christians made before by claiming Jannah is exclusive to Muslims only. Further he states, that those who believes in God without associating any partners with Him, believes in the hereafter without any doubt and do good and useful deeds can enter paradise, conditions several religions offer. He also refers to the Quran 5:66 that there are good and bad people among any religion, and even not all Muslims may enter paradise. Several precise numbers are mentioned in the hadith literature regarding the extremely high standards required to qualify for Jannah. Initially, a select elite group of 70,000 people from the followers of Muhammad will enter Jannah without any accountability of their sins. After the above group, only 1 out of 100 people from the rest of humanity (Muslim and Non-Muslim) would qualify for Jannah. It is understood that despite this small percentage, the actual number of people who would make it to Jannah would be higher, as Allah would forgive the sins of many people, allowing them to enter Jannah as well. Islamic scholars debated whether or not, the jinn can enter Jannah. It is clear from the Quran, that the jinn might be thrown into Jahannam (hell), but does not mention explicitly the presence of jinn in Jannah. The fact, Houris are explicitly described as "untouched by human and jinn" indicates, that jinn could enter Jannah, too. Others however, deny the possibility for jinn to enter Jannah, they could merely try to avoid hell. Accordingly, in the afterlife the fires of hell will be brought forth to the jinn. While the infidel jinn will suffer in the flames, the pious jinn will turn to dust before they touch the flames. On the other hand, we find traditions which explains in more details the nature of jinn in paradise, such as inverting the invisiblity of jinn, thus the jinn will turn into fixed forms, while they can not see humans anymore. Whether or not, jinn could enter paradise, might deal with the ambiguity of the jinn in Islamic tradition: According to one strant, the jinn are the demonic children of Iblis. Since Iblis himself was cast out of heaven, it would be impossible for his kind to get back to heaven. The other strant does not depict the jinn as the children of Iblis, but as a predecessor of human, with many similarities between whose two creatures. Here, paired with humans as creatures endowed with a larger amount of free-will, both can be rewarded with paradise and will be punished with hell. Here, the children of Iblis are not the jinn, but the shayatin. Additionally, according to this tradition, the will of shayatin is linear; they can not avoid hell by being pious, their abode in hell is destined, thus rejecting the former mentioned explanation regarding the fate of jinn in the afterlife. ^ Asad, Muhammad (1984). The Message of the Qu'rán (PDF). Gibraltar, Spain: Dar al-Andalus Limited. pp. 712–713. ISBN 1904510000. ^ Asad, Muhammad (1984). The Message of the Qu'rán (PDF). Gibraltar, Spain: Dar al-Andalus Limited. p. 531. ISBN 1904510000. ^ a b Saalih al-Munajjid, General Supervisor, Muhammad (3 May 2015). "70217: Which was created first, the heavens or the earth?". Islam Question and Answer. Retrieved 23 April 2018. ^ "Surah Nabaa, Chapter 78". al-Islam. Retrieved 23 April 2018. ^ "english tafsir. Sayyid Abul Ala Maududi - Tafhim al-Qur'an - The Meaning of the Qur'an. 78. Surah An Naba (The News)". englishtafsir.com. Retrieved 23 April 2018. ^ "Quran". Quran.com. Retrieved 20 November 2017. ^ Hughes, Patrick (1995). "EDEN". A Dictionary of Islam. New Delhi, India: Asian Educational Services. p. 106. ISBN 9788120606722. ISBN 81-206-0672-8. ^ Muhyiddin Ibn 'Arabi (2004). Divine sayings (Mishkat al-Anwar). Oxford, UK: Anqa Publishing. pp. 105, note 7. ISBN 0-9534513-5-6. ^ Moiz Amjad. "Will Christians enter Paradise or go to Hell? Archived 2007-09-27 at the Wayback Machine". Renaissance - Monthly Islamic journal 11(6), June, 2001. ^ "Allah will bring out people from the Fire and admit them into Paradise". sunnah.com. Retrieved 2016-02-23. ^ a b "4203: How many will enter Paradise? - islamqa.info". islamqa.info. Retrieved 2018-04-07. ^ "Who are the Jews and Christians who will enter Paradise? - islamqa.info". islamqa.info. Retrieved 2018-04-04. As far as the Jews are concerned, their faith meant believing in the Tawraat (original Torah) and following the way of Moosa (peace be upon him) until ‘Eesa came, after which whoever continued to follow the Torah and the way of Moosa, and did not leave this and follow ‘Eesa, was doomed. As far as the Christians are concerned, their faith meant believing in the Injeel (original Gospel) and following the laws of ‘Eesa; whoever did this was a believer whose faith was acceptable to Allah, until Muhammad (peace and blessings of Allah be upon him) came, after which whoever did not follow Muhammad (peace and blessings of Allah be upon him) and leave the way of ‘Eesa and the Injeel that he had been following before, was doomed. ^ "The fate of kuffaar who did not hear the message of Islam - islamqa.info". islamqa.info. Retrieved 2018-04-04. ^ "22836: The ratio of people of Paradise to people of Hell - islamqa.info". islamqa.info. Retrieved 2018-04-07.